You won’t believe how good it is! 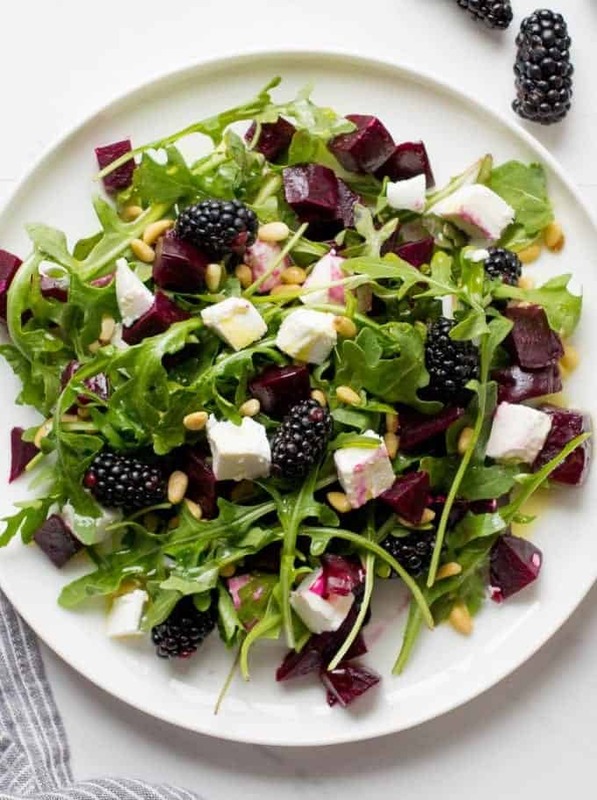 This healthy Beets With Goat Cheese And Arugula Salad is easy to put together and it’s so juicy and delicious. The salad can be prepared ahead of time and can be served as a side dish or a light dinner. One of the reasons why I so love Italian food is because its simplicity. The focus of the recipes is always on the quality of the ingredients and doing as little as possible to them. It’s especially true about salads that are a crucial part of the healthy diet. Italian salad recipes are simple and often require just a handful of ingredients. Frankly speaking, at first I was hesitant to put this recipe up on a blog. After I made it and took pictures, something felt odd. To me, everything seemed too easy. Just a simple roasted beets with goat cheese salad tossed with some arugula and pine nuts. I realized I don’t make such recipes often enough and felt like I needed to add a bunch of other ingredients. I totally changed my mind when I took the first bite. This seemingly simple salad is absolutely delicious. Just like my summer Watermelon And Heirloom Tomato Salad, this Beet Salad is so juicy and each ingredient adds its own incredible flavor to this recipe. I loved the taste of roasted beets – sweet and earthy. In combination with tangy goat cheese and crunchy pine nuts, the salad makes a light dinner recipe or a healthy side dish. The salad is so perfect for spring and summer when you just want to eat lighter and healthier. I definitely can say this about myself and my family. Here, in New England, we’re still experiencing unseasonably cold spring and craving comfort food. But I know for sure, as soon as weather changes, I’ll definitely be making more salads for the main meal, like this Portuguese Grilled Chicken Salad or another favorite Greek Panzanella. I didn’t want to overcomplicate my Healthy Beets With Goat Cheese And Arugula Salad with dressings. Although, I have to admit, in the beginning I was considering a lemon-mustard vinaigrette for the dressing. But after I discovered I was short on mustard, I decided that olive oil with salt and pepper would be plenty. I was so right! This simple salad needed a simple dressing and olive oil was a good choice. It complimented each and every ingredient and brought out their best characteristics. I also love the taste of toasted pine nuts, so I quickly popped them in the oven for a few minutes minutes and they were good to go in a salad. You can also use walnuts or pretty much any nuts that you have in your pantry. 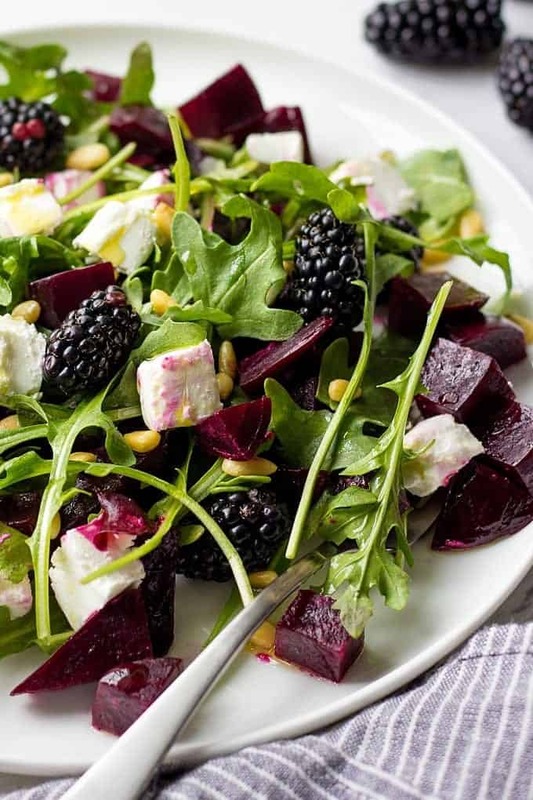 This Beets With Goat Cheese And Arugula Salad is quite versatile too. Feel free to add avocado or cucumbers, or tomatoes. But remember, don’t overcomplicate the recipe. Beets are the main star of the salad and you don’t want to overpower them with a lot of other ingredients. Preheat the oven to 425 F. Wrap the beets in aluminum foil and roast in the oven for 40-50 minutes until soft when pocked with a knife. At the same time, place pine nuts on the baking sheet and toast for 2-3 minutes until slightly brown. Remove from the oven, carefully unwrap and let them slightly cool. Using a kitchen paper towel, remove the skins. Dice the beets and add them to a mixing bowl along with arugula, goat cheese and pine nuts. Season with salt and pepper and toss the salad with olive oil. Sprinkle with fresh blackberries and serve! Let me know in the comments below what is your favorite way to use beets? Do you like them roasted or steamed? Unusually. Looks beautiful and tasty.